This modern twist on the traditional trophy cup features a shield design riser that holds a 2" insert of your choice. 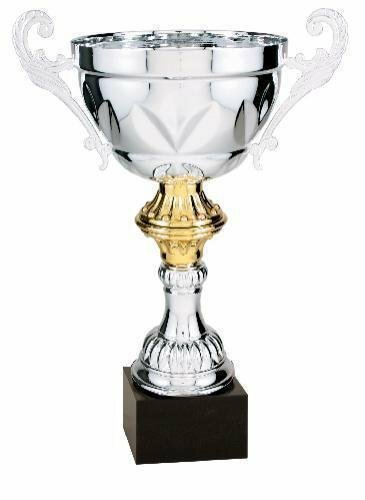 Mounted on a black plastic cup base with lots of room to personalize, this gold cup is a stunning award for accomplishment in any event. 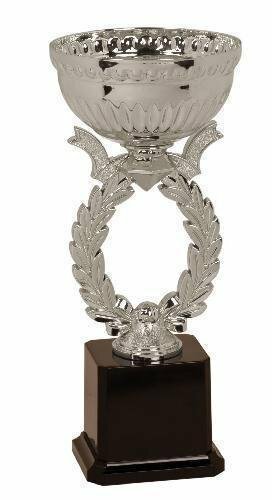 Silver Wreath Easy loving cup trophy with gold cup and handle, black base creates a very nice loving cup trophy for any occasion. Available in multiple sizes.